The English court has recently found that Maguire had infringed Taylor’s copyright in original artistic works comprising various papercut letters and other designs. Taylor was a relatively well known artist in the medium of papercutting and sold her work from a Facebook page in the name of Folk Paper Arts. 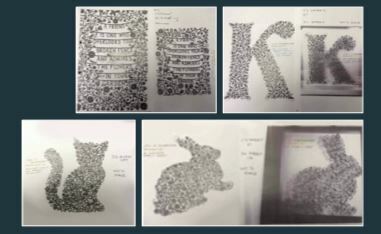 Maguire produced papercutting works which she exhibited and sold from a Facebook page in the name of PAPERtastic. Taylor claimed that the defendant had infringed the copyright in her works by creating, replicating, possessing and dealing in various papercut works, some of which are shown on the right (Taylor’s work on the left, Maguire’s work on the right in each): Maguire denied copyright infringement on the basis that her works had been independently created (i.e. they had not been copied), Taylor’s works were not original, and/or any similarities between Taylor’s and Maguire’s works were not substantial. The court held that a papercut work could be protected by copyright as an artistic work (under the Copyright, Designs and Patents Act 1988) and that the claimant’s works were original and so enjoyed copyright protection. In so finding, the court took into account that in creating each of the works, Taylor made detailed choices including the overall shape of the design, the structure of stems and branches to give them a plant-like appearance and the infill of designs with flowers, birds and insects. The Judge went onto compare each of Taylor’s and Maguire’s works side by side, concluding that there were sufficient similarities between each to find that Maguire had infringed Taylor’s copyright by copying at least a substantial part of the protected works.